Produced by Malay Film Productions. Abidin, an engineer at a tin mine, is indignant that his boss refuses to pay adequate compensation to the family of a fellow worker who died on the job. He promptly quits after a confrontation with the boss, and pays a visit to the family of the deceased at the kampung. There, he falls in love with Faridah and they marry after a brief courtship. Soon after, Abidin’s friend Nasir offers him a job in a newly-opened tin mine. Just as Abidin is settling well into his new job, the mine he is working at is acquired by his former boss (in the aftermath of a world tin trading crisis). The daughter of the boss, Maimun, is appointed the manager and she begins to seduce Abidin, since she has long been romantically interested in him. Abidin finally succumbs to the advances of Maimum and when Faridah realises that Abidin has been unfaithful, she decides to take a train back to her home village…. The bulk of “Antara Senyum Dan Tangis” is shot in studio sets, with exceptions being the Bukit Timah Railway Station in Singapore, one of the tin mines in Malaya, a newspaper press factory, a suburban bungalow, a kampung (of which the location I cannot ascertain) and the ubiquitous lake in the park or the beach for serenading couples in love. Collage of film-stills from “Antara Senyum Dan Tangis”. Faridah the female protagonist, on the right, waits for the north-bound train at the Bukit Timah Railway Station platform as she leaves her husband for being unfaithful to her. The train duly arrives and a station staff receives the key token from the train driver (in the third frame). Film-stills from “Antara Senyum Dan Tangis”. The Bukit Timah Railway Station in 1952. A humble little open-sided brick building that served as a train stop along the Malayan Railway (MR), which runs from Singapore’s Tanjong Pagar station, to Woodlands in northern Singapore, and destinations further up-north along the west coast of the Malayan Peninsula. 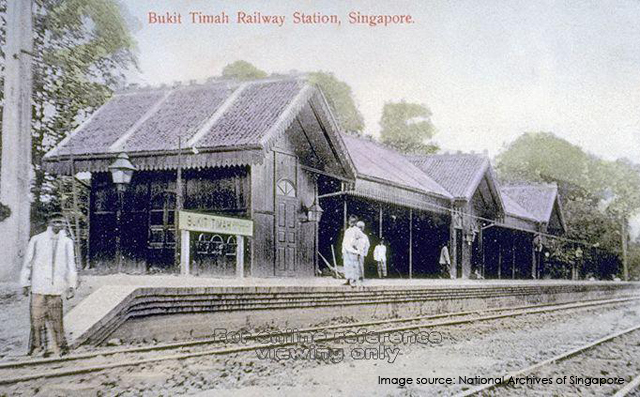 The Bukit Timah Railway Station was originally sited along Upper Bukit Timah Road, in the vicinity of today’s Pei Wah Avenue. It was part of the Singapore-Kranji Railway Line (SKR) that was functional between 1903 and 1932. The SKR (also known as the Singapore Government Railway) first ran between Fort Canning Hill and Woodlands, with stops at Newton, Cluny Road, Bukit Timah and Bukit Panjang, and it was later extended to People’s Park, Borneo Wharf (at Keppel Harbour) and Pasir Panjang. The SKR was later acquired by the Federated Malay States Railway (FMSR) in 1912 and the Pan-Malayan-Singapore rail network was further consolidated (especially after the Woodlands-Johore Bahru Causeway opened in 1923). Admist concerns over flooding in the sections of the railway along Bukit Timah, new deviation railway lines on higher ground were constructed and the Bukit Timah Railway Station eventually shifted to a new location in 1932, adjacent to where King Albert Park is today. From the National Archives of Singapore’s PICAS website. A postcard with a tinted photograph of the first Bukit Timah Railway Station c.1905, situated in the vicinity of today’s Pei Wah Avenue. 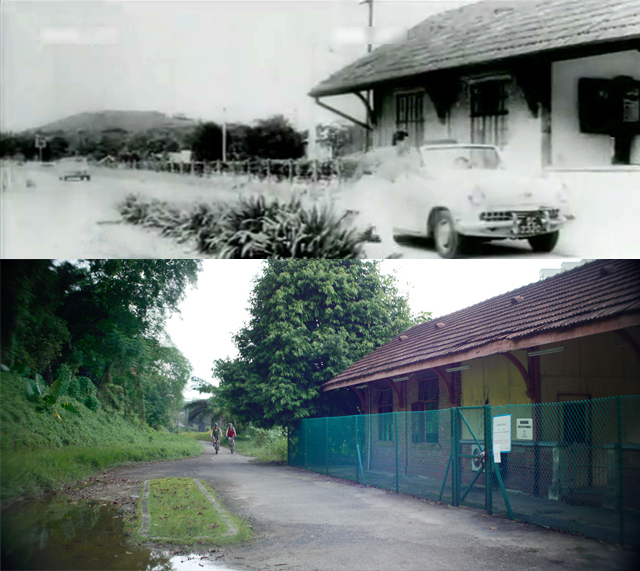 The conserved (second) Bukit Timah Railway Station building in 2013 and film-stills from 1952’s “Antara Senyum dan Dangis” that featured the same building. If you compare the 2013 and 1952 images, you would realise that there was an extension of the station building southwards sometime after 1952, to provide shelter for the group of the signal levers formerly positioned outside the building. So much has been written (and photographed) about this railway station that I really felt a tad guilty for posting an admittedly lesser historical account here. Among the many online articles or blog posts about Bukit Timah Railway Station that I have come across, Jerome Lim’s blog posts in “The Long and Winding Road” are most worthy of a read — detailed, yet not too technical, and plentiful photographs. On the other hand, Malcolm Wilton-Jones and Peter Chan offer very well-researched and credible writings about the Singapore component of the Malayan Railway, all of which include a fair coverage of the Bukit Timah Railway Station too. 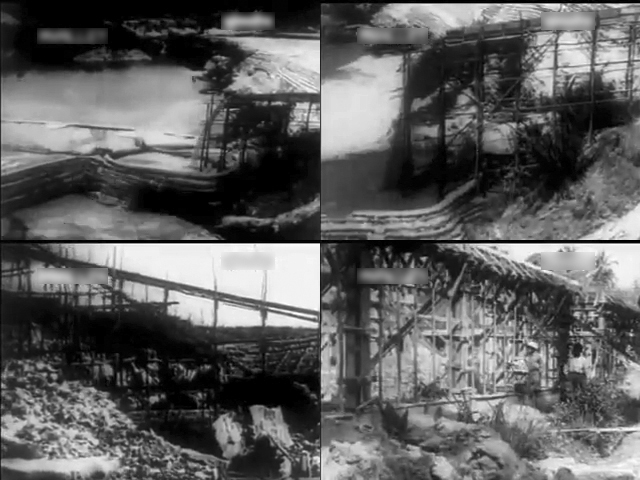 A photograph of the truss bridge near Bukit Timah Railway Station in 2013 and film-stills from 1952’s “Antara Senyum dan Dangis” that featured the semaphore signaling stand/post with the same truss bridge in the background. Film-stills from “Antara Senyum Dan Tangis”. Faridah boards the north-bound Malayan Railway (MR) train alone to return home to her kampung (village)… probably with a heavy heart, as she is evading her unfaithful husband and hoping to find solace in her home village. By the way, the Federated Malay States Railway (FMSR) [1901-1948] was the predecessor to the Malayan Railway Administration (MR) [1948-1962], which in turn was predecessor to the Keretapi Tanah Melayu (KTM) and Keretapi Tanah Melayu Berhad (KTMB) [1962-present]. Up to the 1960s, train passengers (and horses b0und for the Turf Club in the late 1940s- 1950s) could still board or alight the trains at the Bukit Timah Railway station. That probably stopped when the railway station was used as a freight interchange station for the newly developed Jurong Line that was functional between 1965 and the early 1990s. The station was eventually converted into a passing loop (or crossing loop) station where only key tokens were exchanged between the station master and train drivers for access to different sectors of the railway line along the Tanjong Pagar-Bukit Timah-Woodlands stretch. Abidin arrives too late at the Bukit Timah Railway Station train station to stop Faridah from leaving. Film-stills from “Antara Senyum Dan Tangis” (1952). Abidin (acted by P. Ramlee), standing on the platform in front of Bukit Timah Railway Station, looks at the departing train in vain. Faridah has left him for good. Above: Collage of film-stills from “Antara Senyum Dan Tangis” (1952), showing the road leading to the Bukit Timah Railway Station. Below: A similar view of the road and the fenced up railway station building in 2013. I intend to write a post that compiles all the scenes from Singapore-made films in which the Malayan Railway had appeared — the train stations, the train types, the stories, the film characters’ motives and desires, the geography, deliberations on cross-straits relations, etc. Do look out for that in a few weeks’ time. Abidin does his rounds in the new tin mine he works at. Abidin visits the kampung where his deceased colleague was from. “Kemalangan Kereta Api” translates into “Train Accident”. There was a train accident on the Malayan Railways and Abidin feared that Faridah was a casualty of the accident. Film-stills from “Antara Senyum Dan Tangis”. “Chinta” is “Love”. The brief courtship of Abidin and Faridah that is followed by marriage, a daughter, betrayal, adultery and regret. No classic Malay film from the 1950s could do without a lovers’ serenade set in a generic-looking garden, lake, or beach. This sequence from “Antara Senyum Dan Tangis is set in all three and features a medley of three melodious love songs, which are usually titled in combination as one song “Bertemasya” (composed by Yusof B.; lyrics by S. Sudarmaji). By the way, I am clueless as to how the film ended. The digital copy of the film in my collection (from a VCD-rip) had the last few minutes snipped off — a technical glitch or censorship, I do not know. But I do know that Abidin (P. Ramlee) became blind eventually and his eyes gained a hell lot of shadows. This entry was posted in 1950s, Malay Film Productions (Shaw Brothers), Malay-language Films, Narrative Feature Films, Singapore History, Singapore-produced and tagged 1952, blackmore drive, bukit timah railway station, bukit timah train station, federated malay states railway, fmsr, keretapi tanah melayu, key token, king albert park, ktm, l krishnan, lovers' beach, lovers' garden, lovers' lake, malay kampung, malayan railway, mfp, newspaper press factory, north-bound train, old singapore, p ramlee, rail corridor, semaphore signal, singapore, singapore-kranji railway, skr, tin mine.